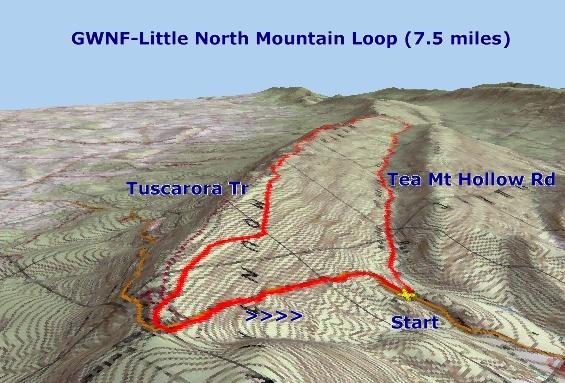 Description: This is a moderate 7.5 mile circuit in GWNF, VA. Although the first leg of the circuit is a relatively typical hike on an old woods road followed by approximately 0.3 to 0.6 miles of tedious bushwhacking, the return route is pretty extraordinary. 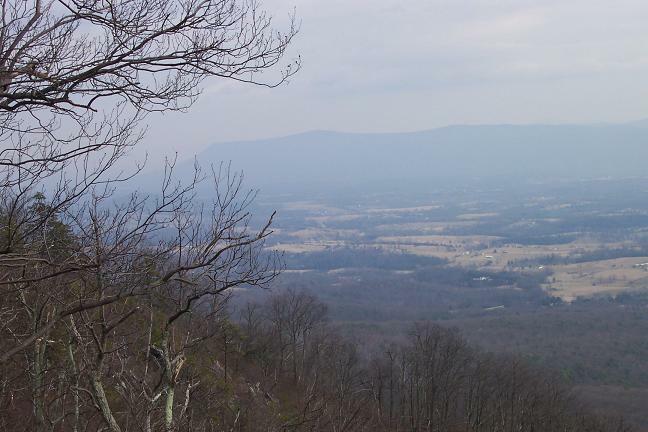 As you walk along the ridge of Little North Mountain you will be greeted with view after view of the Shenandoah Valley and Massanutten Mountain to the east. 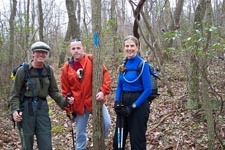 This continues for about 2.5 miles when the trail descends behind the ridge to end at Rt600 at Fetzer Gap. The last mile follows this road back to your car and offers one a nice way to wind down before hopping in your car and driving off. 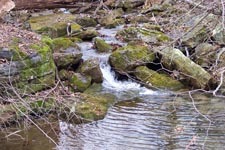 There is a spring coming out of the hillside that offers some very sweet water as a reward for completing this circuit. 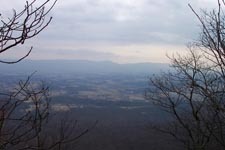 Note: Although I rank this hike as moderate it requires good map reading and compass skills and/or use of a GPS for the bushwhack portion. 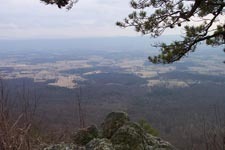 Since this hike requires a bushwhack I suggest that new comers try it before the foliage is thick. There will be a small pull over at an old woods road and an electrical box next to it. Trail Notes: From the trailhead proceed up Tea Mountain Hollow Road. The road will soon converge with and follow the left (east) bank of Cove Run. Soon you will cross an ATV barrier. The road will split. The right fork crosses the stream and ends at a campsite. Continue on the main road. Other woods roads will come in from the left. I believe these all come together and would take you back out to Rt600. None follow the trek all the way. Continue to walk up the hollow keeping Cove Run on your right. Old cuttings of blow-downs that at one time fell across the road indicate that this had been a maintained trail at one time. Other untouched blow-downs, some lying lengthwise in the trail, suggest that trail maintenance had stopped a quite some time ago. At almost exactly 2 miles from the start of the hike you will climb over a couple of old logs and find that the road has totally disappeared. This is where the bushwhacking begins. I indicate that the bushwhack can be anywhere from 0.3 to 0.6 miles in duration. This is because there is an unofficial spur trail at the draw where the Tuscarora trail crosses it. If you find this trail the bushwhack is over. If you don�t find the trail you�ll have to keep working through the brush and blowdowns until you hit the Big Blue. 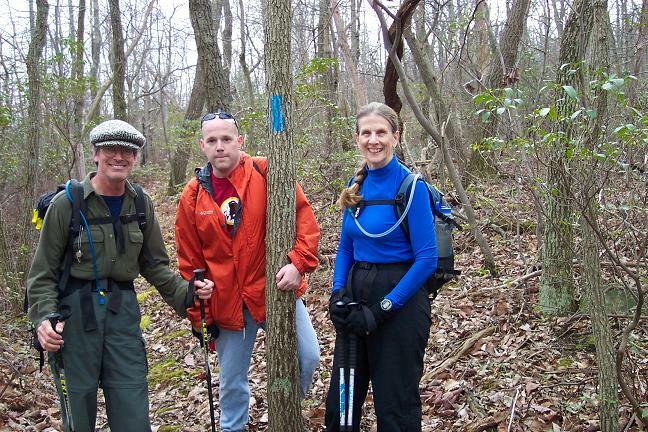 If you�re using GPS, finding the spur trail will be a lot easier. When the road finally disintegrates continue hiking up the middle of the hollow. The key is to keep the stream to your right. This will eventually turn into a rock scree under which the stream flows. Whether it is a stream or a rock scree keep this feature to your right. 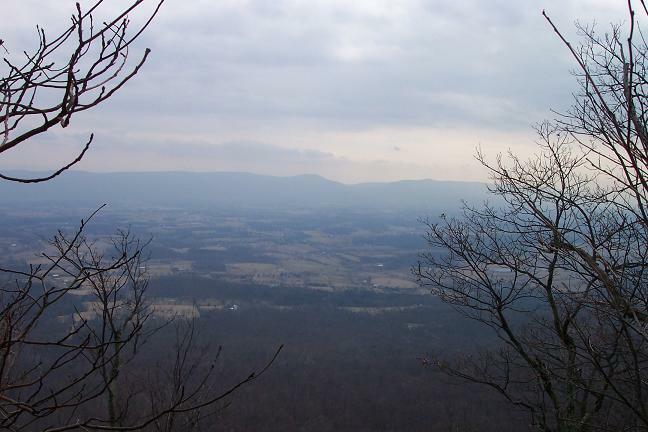 If you find the briers, brush and blow-downs too tedious move to the left (east) and walk in the shadow of the hill that rises up to become Little North Mountain. Do not get up on the hill. As you walk along this contour stay in touch with the stream/rock scree. You should eventually find a Sphagnum bog with a spring bubbling out of it. In the winter this is easy to spot because the peat is pale yellow in color. In the summer it will be green and harder to spot. From this point look for yet another bog a little further uphill. As you cross it you will pass over the last of the rock scree and hopefully find an un-blazed, lightly used trail. If you do, follow it for another 0.3 miles as it weaves across the middle of the draw until you step onto the well worn and equally well blazed (blue) Tuscarora trail. If you do not find this trail continue to bushwhack up the draw, tending toward the left (east) of the low point to ensure that you will eventually hit the Big Blue. From there turn left and follow a nice set of switchbacks up to the ridge of Little North Mountain. 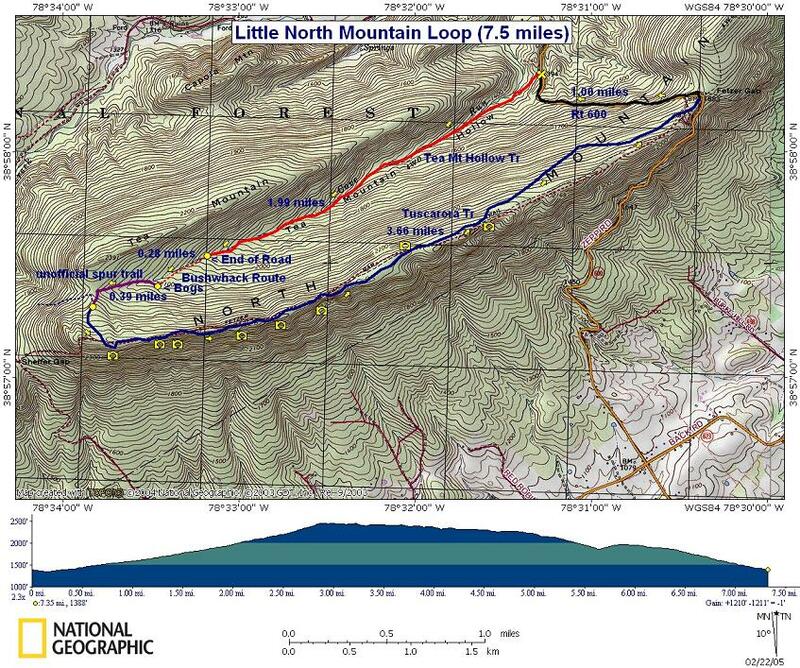 The trail will make a sharp left turn and generally follow the ridge for about 2.5 miles. Almost every rock outcrop offers views of the Shenandoah Valley and Massanutten Mountain to the east. If you look carefully you can also find views to the west of Paddy, Great North and Tea Mountains. 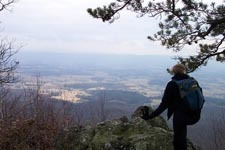 At the end of this segment the trail will drop down behind the ridge for a while before ascending a bit and ending at a private gravel drive at Fetzer Gap. Follow this straight to the intersection with Rt600. Turn left and follow Rt600 for 1 mile back to your car.